It was clearly Barbaras fault. The mutual fund was in her name and she didnt report the dividends and capital gains. Her story was that she never got a 1099. But, the IRS got their copy. What I got was a new tax bill, wrapped in the soft comfort of interest and penalties. It must be a marriage thing. She gets the income and I get the bill. But, this time it was gonna be different. This wasn’t my error. I was an innocent spouse! Thats the poor shlump that files a joint tax return that turns out to have omitted or understated income, or overstated deductions or credits. Because its a joint return, youre subject to whats known as joint and several liability. That means that youre personally liable for the total tax, regardless of who earned the money or who negligently, carelessly, or intentionally screwed up. But, Im not bitter. To qualify as a classic innocent spouse, at the time you signed the return, you couldnt know or have any reason to know that there was an understatement of tax due to erroneous items caused by your inconsiderate and thoughtless spouse. Well, maybe a little bitter. In any case, if, based on the facts and circumstances, it would be unfair to hold you liable for the understatement of tax, you qualify. File Form 8857 and you’re free from liability. Even if you dont qualify for classic innocent spouse relief, you can be released from liability if the facts and circumstances mandate relief on an equitable basis. This escape hatch works even if the return was correct but the entire tax has not been paid. Barbara wasnt buying any of this. Despite my impassioned argument that both the facts and equity made me an innocent spouse, she wouldnt budge. By definition, theres no such thing as an innocent spouse, she proclaimed. Before you continue arguing, review the qualifications for an injured spouse, she suggested. Jeff A. Schnepper Esq. is the leading authority on finance and taxation. 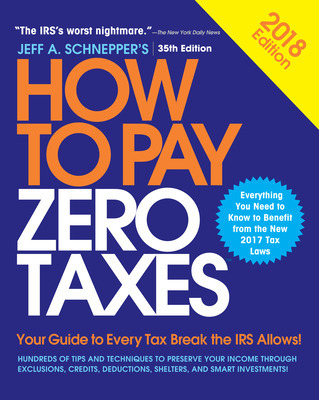 He has written multiple tax books including all 34 previous editions of How to Pay Zero Taxes. He is a financial tax and legal advisor for Estate Planning of Delaware Valley and operates a tax accounting and legal practice in Cherry Hill NJ.